Marx (1818-1883) accepted Hegel’s ideas in modified form contending that the Absolute, rather than being God, is nature (matter) unfolding itself in an endless process of dialectical development. Marx replaced Hegel’s Spirit with matter and economic interests. By substituting economic forces for the Absolute as the definer of history, Marx thereby secularized Hegel’s theory. In addition, he replaced Hegel’s warring states with the class struggle and Hegel’s monarchy with the dictatorship of the proletariat. By proclaiming that the Absolute is simply a reflection of matter, Marx uses the dialectic as the ruling force in the evolution of history. Social events are thus rooted in, and determined by, matter. Historical phenomena such as culture, philosophy, politics, and religion are determined by economic factors such as the method of production. At each stage of history, the class that controls the means of production controls society. Not a static situation, each mode of production generates an opposing movement. Marx liked the Hegelian idea that moral ideals are realized in the march of history, but wanted to seek the ideal in the real itself. Marx learned the dialectical method, through which one looks for contradictions, from Hegel, but transformed Hegel’s dialectical idealism into dialectical materialism. He thereby switched the focus from Hegel’s vertical transcendence to his own emphasis on horizontal transcendence. Marx was a materialist who repudiated Hegel’s doctrine of the primacy of consciousness (i.e., thought) and who believed that the nature of thought is determined by the material reality of that which it reflects. The pivotal person in this transition was Ludwig Feuerbach who taught that men were mistaken when they gave away their humanity to a “God illusion.” He said that people were attributing to God all the good and admirable traits of man, thereby leaving men impoverished and alienated. For Feuerbach, God (and religion) is the projection into the heavens of man’s deepest longings. The individual man, realizing that he himself is not perfect, combines all the virtues and perfections of all the people and projects a composite figure into the heavens and calls it God. Feuerbach proclaims that this is mistaken and that all the purported perfections of God are already in the species man as a whole. Declaring that man is a species being who lives for the species, he states that if such a being believes in a transcendent God then he necessarily feels alienated from his true essence. Feuerbach tells us that we can reclaim our essence by calling back this projection from the sky and instead turn to worshipping mankind (i.e., ourselves) in the collective. He says that Hegel was teaching us to love the wrong thing and thus to hate ourselves. Feuerbach proclaimed that Hegel’s philosophy was a fantastic imagining and that the truth was actually anthropological with man’s essence existing in his productive work. In order to reclaim man’s essence, men would need to change the conditions under which they worked. This could be done by shifting people’s love from God to mankind and by taking part in work communally for the benefit of all of mankind. Marx was attracted to Feuerbach’s idea of the sensible and concrete goal of making actual the humanity that is within us and on earth. Marx focused on actions taken to change the material world and the conditions under which we work. Whereas Feuerbach saw man enriching God and degrading and alienating man by making Him the creator (or grand producer), Marx more particularly saw the enrichment of the capitalist and the impoverishment and alienation of the workers as mankind’s greatest problem. Marx’s goal was to overcome the duality between owner and nonowner and to transcend and end economic classes, the source of the conflict. Marx believed that a society preceded recorded human history in which men experienced no sense of alienation because there was no alienated production. Under a system of primitive communism, the necessary product was produced for the whole tribe, the division of labor was absent, and the worker actualized himself as a species being. By some means, men entered into patterns of alienated production and the accumulation of private property. Men began to appropriate the products of other people’s labor for their own purposes. The products a man produced confronted him as things apart from him and thus he was alienated from his work. Alienation, a parting or estrangement with something, occurs when products are taken by employers as well as when products are transferred to fellow workers when a job is broken up into specialties and workers separated into rigid categories. Man is non-alienated when he sees the whole product. Man is alienated from the product of his labor when the capitalist appropriates it. The wage earner is thus alienated from the product of his labor. He is alienated from himself by private property that sets him against others and separates him from his social nature. Man’s life forces are taken from him under the system of alienated labor. For Marx, the division of labor is forced labor. Contrary to man’s real essence, the division of labor is what is wrong with the world. It is the division of labor that creates class differences and suppresses the unity of the human race (i.e., the species). Marx, like Rousseau, argued that the longing for private property led to the division of labor, which, in time, gave rise to the existence of separate social classes based on economic differences. Marx saw the essential nature of man as a species being who labors cooperatively. He argues that language is a social product and that, in time, language is the creator of reason (i.e., consciousness). Reason, for Marx, is a social product! The social whole is the locus of reason and the essence of man’s reason is collective. According to Marx, man’s potentialities are those of the entire species. Thus, whenever man acts, he does so as a surrogate for the whole species. As a proxy or stand-in for humanity, a person’s individual self is simply a manifestation of a fundamental underlying universal self. Only by activating the potentialities of the species can an individual find his fulfillment. It follows that truly human work is nonalienated labor through which a person has the opportunity to actualize the whole spectrum of human potentialities just as he has a mind to. Marx thus denies the legitimacy of the idea of the division of labor by saying that a person need not and should not be anything specific with respect to his work. Alienated individuals are portrayed as worthless, degraded, and without dignity. There can be no self-esteem in a market economy. Marx says that a person can only truly fulfill himself when he acts as a species being. It is only when a man’s explicit, honest, and direct motive is to produce for mankind that he can fulfill his true self, his species self. Influenced by Kant, Marx argued that a man loses his moral worth when he produces efficiently for the market. The fact that he is specializing for his own benefit indicates that he is not pursuing the ethics of the whole species. Marx thus echoes Kant’s conflict between the desire to benefit and succeed and the pursuit of one’s moral worth. A person’s motive is what counts in the moral sphere. A man’s true self is his universal self. Marx agreed with Kant’s notion that man has a deeply concealed essence. Marx thus sees man as having two selves—a fragmented, alienated, greedy, success-seeking self and his universal species self. Marx’s ultimate goal is to overcome, through revolution, the separation of man from his true self caused by the modern world of work. He wants to put man in a position in which he can engage in any kind of work that he wants to. His goal is to end alienation by reuniting man’s life with his essence. He wants men to realize that only when they all achieve do any of them achieve. For Marx, the purpose of work is the development of man as a collective (i.e., of the species man). Marx believes that in communism, man will become reunited with his species essence―his abstract, communal essence. At that time, the full potential of human life will be released. Marx’s goal is a future society in time and space that would permit a full, harmonious, and perfect human existence. Marx states that the sole and permanent cause of history is the change from one mode of economic production to another. He even views consciousness as a derivative of economic factors. For Marx, consciousness is a by-product of the material forces of production. The individual’s mind is shaped by his tools and by organization of the workplace. According to Marx’s doctrine of historical materialism (called dialectical materialism by some later writers), the laws of history are based exclusively on the material (i.e., economic) conditions of life. Marx considers the economic factor the key to the evolution and interpretation of all human history. Marx thus adapted the Hegelian dialectic to a materialist theory of human society. For Marx, all history is explained in terms of the nature and development of the factors of production, including both the material forces of production and the social relations of production. The material forces of production, which Marx assumes to tend to grow, include technology, factories, machinery, and so on. The social relations of production include all the rules directing men in their use of the material forces of production. The social relations of productions include answers to questions such as: Who owns? Who gives orders? Who takes orders? etc. It is the material forces of production that lead to the social relations of production. The social relations of production equal what Marx terms the base of society, the rules governing a man’s access to the means of production. These social relations of production comprise what we would call civil society. Changes in the forces of production and the relations of production altered society’s economic structure resulting in mankind’s fall from the age of communal property and primitive communism. A social superstructure forms around the economic structure to justify and enshrine it. This superstructure is determined by the base of society and is made up of all the laws, philosophies, religions, moral codes, ideologies, politics, educational institutions, books, and other aspects of culture. As the material forces of production change, there is tension between them and the old social relations of production. Eventually, a massive revolutionary change takes place, resulting in new social relations. In turn, the social superstructure changes in response to the changes in the base of society. According to Marx, the forces of production via the social superstructure have produced two separate forms of social consciousness—one for the owners and one for the nonowners. After a while, the social superstructure lags behind and becomes archaic, resulting in a reactionary false consciousness. Marx explains that some people want to preserve the social superstructure (i.e., capitalism) despite the fact that new forces of production render it ready for change. Of course, there are some insightful progressives, like Marx himself, who understand the changes that need to be made! Although the forces of production are evolving, the advanced productive energy is constrained by the old social superstructure. Tension between the change agents for the future and those supporting the old social superstructure will lead to revolution and the overthrow of the old social superstructure and its replacement with a new one to justify the new economic structure. Numerous incremental and quantitative changes and tensions accumulate until a sudden and radical qualitative change takes place via a revolutionary process. People, who are aware of the new forces of production, those being exploited by the old social superstructure, develop a class consciousness and rise up to overthrow the old superstructure. Marx explains that worker exploitation is the catalyst for the objective conditions necessary for the defeat of the capitalist social superstructure. At that point, a dictatorship of the proletariat will take control of the state in order to eradicate capitalism. For Marx, the state is an instrument of social control used by the members of one class to suppress the members of another class. The state recognizes the rights of the possessing class in order to exploit the non-possessing class. It follows that the proletariat must use the state to destroy the remnants of capitalism and its ideology. After the demise of capitalism, there will be no more need for a state because only one class, the proletariat, will then exist. Whereas Kant had taken the mind’s structure as a given, Marx contends that all men do not have the same method of thinking—humanity can be split into contending groups, each with its own distinct mode of consciousness and competing with one another in its efforts to define reality. Each group thus creates its own truth. There is a different truth and a different logic for each type of person. Marx thus pluralized Kant’s social subjectivism by proclaiming that each rival economic class has its own way of defining the truth. The labor theory of value is a key concept in Marxian ideology. Marx held that the value of commodities is determined by the amount of labor used in making them. Labor power is the only commodity capable of generating surplus value. The source of profit is the difference between the value of the labor sold by the worker and the value of the commodity that was produced through his labor. Workers are systematically exploited because the difference accrues to the capitalist. The worker is cheated because the employer, rather than paying him the full value of his labor, keeps the profit for himself. The employer does this by paying less to the worker than the valued added by his labor. Capitalists pay laborers enough for their sustenance, appropriate the surplus value, and reinvest it in more capital. As capital becomes greater in proportion to labor, the source of the surplus value is reduced, and the workers are forced to work longer, harder, or for reduced pay rates. Ironically, whereas the capitalist’s goal is to gain surplus value, he undermines the very source of surplus value by exploiting the workers. Marx distinguishes between production for use and production for exchange. He explains that it is unnatural to produce for exchange rather than for use. Whereas a product has use value, a commodity, which is made for sale or trade, combines use value with exchange value. Exchange value is found in the social relations of production. When one produces for use he is fulfilling his species unity. Contrariwise, with respect to commodity production, one produces for the market, destroys the joy found in creation, breaks up the original unity of the production process, no longer controls his product, and becomes competitive and alienated. All commodity production necessitates a sacrifice of labor under alienating circumstances. Marx explains that social institutions should conform to a given mode of production. Revolution is inevitable when they fail to do so. He argues that the contradictions inherent in a capitalistic society will lead to a class struggle between economic groups that will ultimately result in a classless society. 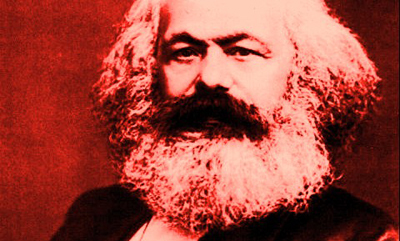 Unlike Hegel, Marx is only concerned with one triad—capital, labor, and the classless society. As the objective conditions for revolution come into being, the proletariat develops a class consciousness or awareness of their circumstances and exploitation by the capitalists. The proletariat wants a classless society and economic equality, rather than just equality under the law. By acting for all men, like Hegel’s hero in history, they will seize the state and eliminate private property, the division of labor, and class barriers. The state as the representative for the dominant class will deteriorate and will simply become an administrative body for all. Alienation will end under communism where the purpose of work will be seen as the production of the species man, our essential being. Man will no longer be separated from man—he will be totally social. For Marx, history can only be understood as a succession of class struggles in which primitive communism gave way to slavery, slavery to feudalism, feudalism to capitalism, with capitalism yielding to socialism and eventually communism. Only then will class divisions and alienation end and will man be reunited with his essence. Marx argues that this revolution is not just another step in the dialectical process because the oppressed group is so massive that they become representative of humanity. In addition, their suffering is so harsh and intense that they embody the essence of all human suffering and thus desire to end all of mankind’s pain and hardships. Because the revolution is different from all others, there will be an end to the process. The victory of the proletariat means the extinction of class societies and the end of class struggles. Marx argues that under capitalism the proletariat has gradually absorbed all social groups except for a small contingent of capitalists. The victory of the proletariat will thus be a win for almost everyone in society (except the capitalists). Class conflict will end and class divisions will have been eliminated once the proletarian victory has been achieved. The spirit of true community can only be established gradually by abolishing the causes of selfishness and by a long process of education. Between the overthrow of the capitalistic system (and the bourgeois state) and the rise of a new society in which the individual functions as a cell within a living body, Marx calls for the interim rule of the dictatorship of the proletariat. During this proletarian stage of socialism, the proletarian majority will use the state in behalf of the overwhelming mass of the people. After capitalism has been conquered, there will be no further need for the state. Marx contends that soon this form of state will itself disappear as selfishness, force, and coercion vanish from human relations. Marx did not accept Hegel’s idealization of the state. Rather, he longed for its eventual and gradual atrophy, with its function falling into disuse in a fully socialized society that guarantees the highest possible degree of happiness for everyone. As the exchange economy crumbles, the move to communism takes place. Goods and services will be moved from the exchange system to the social dividend system and will be distributed to citizens according to need. The Hobbesian struggle of “all against all” will disappear because there will be plenty of goods and services to go around and no need for competition or theft. With no need for force, there will be no need for the state to keep order and security. Marx thought that man was only rational as a species. Rationality was not an inherent characteristic of the individual whose decisions were chaotic and based on what he called product fetishes. Because it is only society or the group as a whole that can think rationally, Marx called for economic decisions to be made by a rational group of central economic planners. Marx’s assumed ever-expanding forces of production called for the policy of conscious collectivist planning for the production of goods and services for the use of society as a whole. Marx condemns capitalism because it is alienating; he does not view it as necessarily unjust. Only if one’s direct motive is to produce for the species, instead of for himself, can a man truly fulfill his real self. He says that we are fortunate because there are latent and inherent problems or contradictions in capitalism that will lead to a revolution of the proletariat and the overthrow of capitalism. These conditions include the increasing misery of the proletariat as capitalists try to get more out of their workers, declining profits, and periodic and deepening crises and business cycles. Marx’s humanistic doctrines supplied a flexible philosophical basis for many of the reigns of terror experienced during the twentieth century. The implication of his idea of the communal nature of man is that the individualist who diverges from this doctrine is branded as being against human nature. His tenets of historical materialism, class consciousness, and the collective nature of thought and rationality lead to polylogism and group warfare. To these are added his convictions that production for gain and trade is inhuman and alienating, that the division of labor is malignant, that a person’s need constitutes a claim, and that private property in the means of production must be abolished. Given all of the above, there will always be some group of intellectuals who “know” what is best for everyone and who are ready to use force to enforce their convictions. Of course, they want to employ some other oppressed class to battle for these changes. Marx fails to explain how a communist society could abandon the specialization of labor that made the wealth and productivity of modern society possible while concurrently retaining modern production methods. In addition, he did not grasp the illogic of his labor theory of value. He did not comprehend that the value of labor stems from the value of the laborer’s product that is determined by supply and demand. He had it backwards. The value of the product is not determined by the value of the labor. He also failed to see man as an entity with a specific nature. According to Marx’s concept of human nature, man had both an essential nature as a human being and an historical nature that developed and evolved. With respect to this historical nature, Marx viewed man as a process to be changed. He also envisioned a changeable world that, having been constrained for centuries, would progressively become less constrained and ultimately unconstrained in some future time when there will be abundance, no alienation, no state, no egoism, no psychological insecurity, production for use, and no production for profit. In short, everything will be public and the individual will become fully socialized. Chris Matthew Sciabarra has observed that Marx’s Utopian view of the world is essentially an acontextual, ahistorical quest for human ideals with no understanding of the limits or nature of reason. Marx’s historical materialism presumes a kind of synoptic knowledge on the movement of history that is invalid because it drops the real context of human conduct. Marx’s problem arises when he steps into the future to evaluate the present from an imagined future vantage point that holds as one of its premises the possibility of “total knowledge” which enables the proletariat to plan the society with virtually no deleterious unintended consequences. Marx assumes the information required by future planners will be available despite the fact that these planners will have destroyed the mechanisms (i.e., the price system), which permits such information to be generated and socially traded. Marx is projecting that the same kinds of knowledge will be available to a future generation of planners in the absence of the context that makes such knowledge possible and specific to a particular time and place. Marx is placing himself outside the very historical process that he analyzes. It is as though he is permitting himself privileged access to information about a future that is ontologically and epistemologically impossible. Marx’s flawed vision presumes a total and omniscient grasp of history, the possibility of godlike planning and control, and a mastery of the many resources, tacit practices, and consequence of social action.